Meanwhile, I’ve finished my warmest sweater to-date, lol, my second edition of Michele Wang’s Bellows cardigan. I was SO RIGHT back in February when I shelved this: My November self could not have been happier to get to finish a sweater exactly as the corresponding weather for it arrived. I mean, how often does that happen? When I put it away, I had seamed the shoulders, knitted the button band, and left myself some notes for record-keeping purposes. So all I had to do on Sunday evening, with the first overnight freeze upon us, was seam the sides and sleeves and sew down the pockets. And well, in theory, sew on the buttons, but I haven’t identified the right ones yet. This will definitely qualify as a coat here in Nashville for most of the season, and I still expect to wear it mostly on my couch on cold, drafty nights since the color is so weirdly difficult to pair with anything. * But I wore it to work on Monday with my natural wide-legs and black tee — the only outfit I’ve come up with so far — and it was cozy both indoors and out. 1) I added pockets. There’s not really an ideal way to do it with this stitch pattern, so it’s slightly awkward but worth the trade-off. I have pockets! All I did when knitting the fronts was to knit the first chart repeat once, then 4 rows of ribbing between the two slip-stitch borders for the pocket edging. The pocket lining is 16 rows of reverse stockinette then the first 4 rows of the second chart repeat, so the ribbing on the pocket overlays the bottom 4 rows of the second cable, which makes it look a bit truncated. But pockets tend to hang open a little bit, giving you a glimpse of the cable inside the pocket, which I think optically balances it out a little bit. I’m not sure anyone would ever be aware of it if I didn’t point it out — they look more natural than I thought they would. 2) I wanted the button band to be a bit narrower on this one, but conversely wanted the shawl collar to be a little more voluminous than the original. With the difference in gauge I was really winging it on that adjustment. I removed 4 four full rows of ribbing, making the band a total of 8 rows rather than 12, and worked some extra short rows for the shawl shaping — 13 on the first short-row sequence, 11 on the second, according to my notes. (I no longer know how that compares to what’s in the pattern.) With the narrower band, I worked 3-st buttonholes, for slightly smaller buttons, so now I need to find the right buttons. Ultimately, this thing is a beautiful beast, being extremely warm and also taking up an entire cubby in my little closet, so we’ll see whether it winds up getting worn enough to earn its keep. But for now, with the temperature having not escaped the 30s yesterday, I really am happy to have it! I love this classically woolly yarn and think it made for a powerhouse sweater, but there’s no question my original yarn choice (Balance held double) made for a more regionally appropriate version. *For everyone who keeps telling me it’s not a hard color to wear, please try to understand that you really can’t know — unless you’ve seen this yarn in real life — and take my word for it? I can’t even get a photo to reflect the actual purpley-dusty-tourquoiseness of it, much less demonstrate how it really does not go with denim like you’d assume it would. This entry was posted in Projects and tagged bellows, knitting, ktfo2018, KTFOs, sweaters. Bookmark the permalink. Beautiful! Love the shawl collar. I agree – stunning, and I marvel that ANYONE could knit something so complex and beautiful, as that sweater is. I am pretty pleased that I can knit a washcloth! That is such an heirloom. And P.S. Got my Town Bag in the Pecan colorway and ohhhh….it’s PERFECT. Sorry for the caps, but had to emphasize! Oh yay, thanks so much! And this is really a pretty simple sweater, and very quick to knit. I always say it’s a good candidate for a first sweater. Oh it’s perfect!! I also live in a “wool sweater for coat” type climate, and it works perfectly for me since coats make me so claustrophobic. Your winter coat looks perfect! YAYYYY YOU!! It really is lovely! I’ve been cold here in NE Georgia for two weeks now, so this looks like the perfect cardi to get me through the Winter (and Fall, and Spring)! I am always drawn to that color, and then have the issue of what to wear it with! My go to move is just to go black for everything else, but I do like the cream/black/blue. It really is a beautiful sweater. I love light/denim blue from head to toe, and wish this were that color. Unfortunately, it’s not, which is why it’s difficult. It’s more turquoise than that, with purple and green mixed in. Can’t describe it. That’s a beauty, congratulations on a beautiful chunky cardigan. I can understand it might not go with denim, but what about all the shades between cream and camel? And anything black for sure. Love your first outfit. I have these natural wide-legs and natural jeans, so that’s two! The sweater is lovely! As for the color, if you think it’s a tough color to match with your wardrobe, then that’s all that matters. I hope you do find a way to make it work! I wonder if it’s the kind of thing where could could lean into the clash and pair it with the least likely items in your wardrobe? Not saying it would work but maybe it’s worth a try. But again, what matters is that YOU feel comfortable, not anyone else here who comments on the color. Beautiful stitch definition! Were you able to knit it using the recommended 10 and 11 needles? It looks chunky but not bulky. I think I saw the color on Harrisville website-out of stock:( but yes-lovely hints of purple in there! I have the back and both fronts done on my Bellows, in a wonderful creamy off white. But I am having surgery on my hand Friday and don’t know if I’ll be knitting for a while (on the plus side, this is to fix the arthritis in my thumb that has plagued my “making” for several years). So right now I’ve been banging out some Christmas gifts, just in case the knitting is on hold for a while. But I want this sweater for when it gets cold here! Oh gosh, good luck with that! When Bellows came out, I made one in the color the model was wearing. Then I thought, I’ll never wear this because it is blue. But it has turned into my winter coat for most days. It goes with my jeans and black pants too. I love yours with the natural color. In my mind, this is that color of blue. Unfortunately, in actuality, it’s not! I wish it were. It’s not exactly any of the sizes — see my notes in the post above about all of that. Would you ever consider dying it? That sounds like a nightmare! But I will find it a new home if it doesn’t work for me. 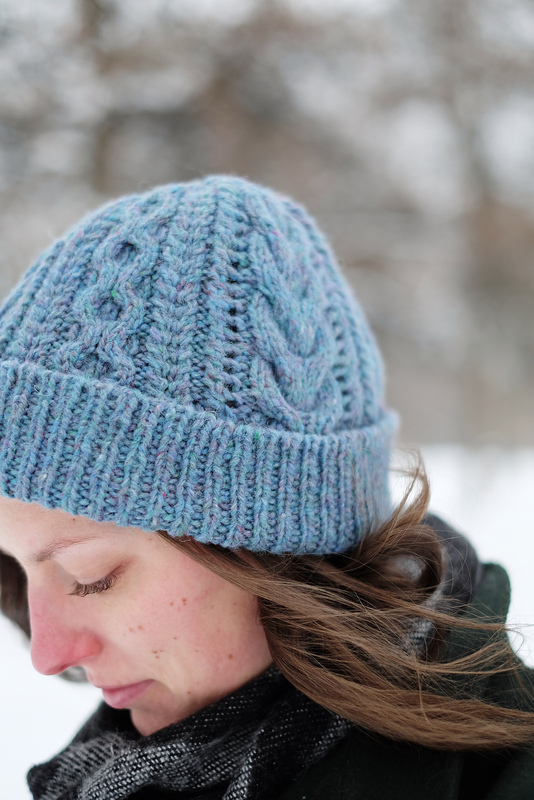 Either way this came out gorgeous and most importantly sounds like it was fun to knit! It is fun (and quick) to knit, yeah, which is why I’ve done it twice – and can imagine doing it again! I totally understand how it is when your yarn is a lovely colour but not one you necessarily want to wear in large quantities – or one that can photograph showing the challenging tonal nuance. I have far too many yarns that fit this description because I bought them online. Sure – I had a swatch card, but every dye lot is different and a tiny swatch ain’t a skein (or 8). I’m buying in boutique lately because I really want to know what I’ll be knitting up. Not that I haven’t managed to buy yarn I’ve seen in real life, only to feel ambivalent about the colour thereafter. I find that using an alternate colour (for cuffs, hem, collar) or striping can make a huge diff in shaking up the profile and making it much more appealing to me. I love it on you. Period. Color be damned. Hi Karen! What a beautiful sweater. Would pairing it with camel work? Or a cinnamon color? Kind of whatever is opposite the color wheel? It looks awesome with winter white and maybe would be great with charcoal and pale grey. Can’t wait to see what you decide! I do think it probably goes ok with my toffee colored pants, although those aren’t the best shapes together. Possibly my paint-stained old wide-leg khakis. I forgot how gorgeous that hat is! And your photo does show the flecks much better, although at least on my screen that still looks more like a light denim blue than the turquoiseness of it! I would love to post a close-up, but my phone will not take that photo — it freaks right out, no matter what I try. Oh my! It’s absolutely splendiferous! And that colour is just amazing. I love it with the natural pants. You are just so “you” in these photos. It’s beautiful! I take your point about the color being hard to work with in terms of other garments but I think it’s lovely on you. That looks so incredibly cozy! And pockets! Maybe if the color is hard to coordinate with, it could be more of a slouch-around-at-home sweater? Having a color not be quite what you envisioned is frustrating, I totally get it. That’s my plan, but unless I wear it nonstop all winter like that, I’ll likely decide to find it a new home instead. I tend to be drawn to the weird shades of any color. Black pants will go with these (and pretty much any weird shade). I put more time into buying buttons than I do in buying yarn; shell buttons, which come in many shades, usually work with the weird heathery colors. The iridescent aspect seems to compliment all those colors that don’t really appear on a color wheel. If the color really wears on your, an indigo dip could help. Then again, there’s always navy blue too. Hmmmm… purpley-blue? Time for some black denim? Interesting to hear that the color is difficult. I bought a few skeins of it, but with the idea of using as a contrast in a colorwork sweater in a yoke. Wonder if I will decide it will not be practical. But it’s been sitting for over a year, so I can let it marinate a little longer.